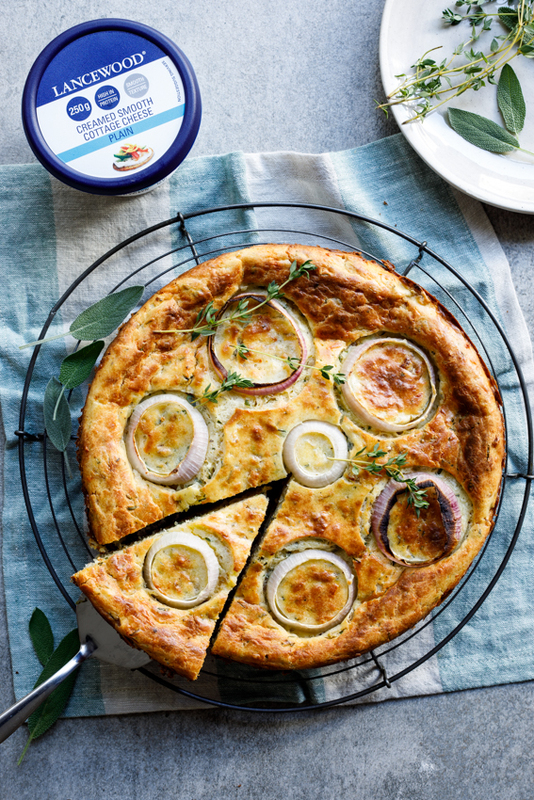 Inspired by Ottolenghi’s cauliflower cake, this cheese and onion savoury cake is filled with cheese, herbs and red onion. It is the perfect elegant yet easy lunch recipe and will make an excellent vegetarian main. 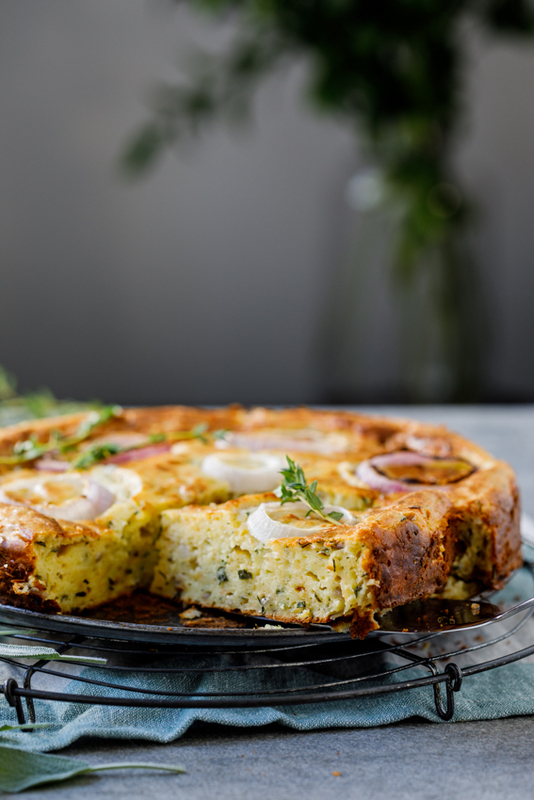 When I first saw Yotam Ottolenghi’s cauliflower cake, I was absolutely smitten and I knew I had to make a savoury cake of my own. This is the man who has brought Middle-Eastern flavours and techniques to the forefront and put the focus back on vegetables, and vegetarian cooking, in all its glory. 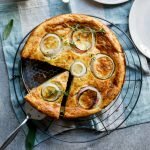 I was therefore incredibly excited to make this cheese and onion savoury cake because it is the kind of recipe I just love. 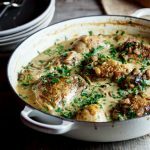 Simple, packed full of flavour and so moreish, I couldn’t resist seconds. 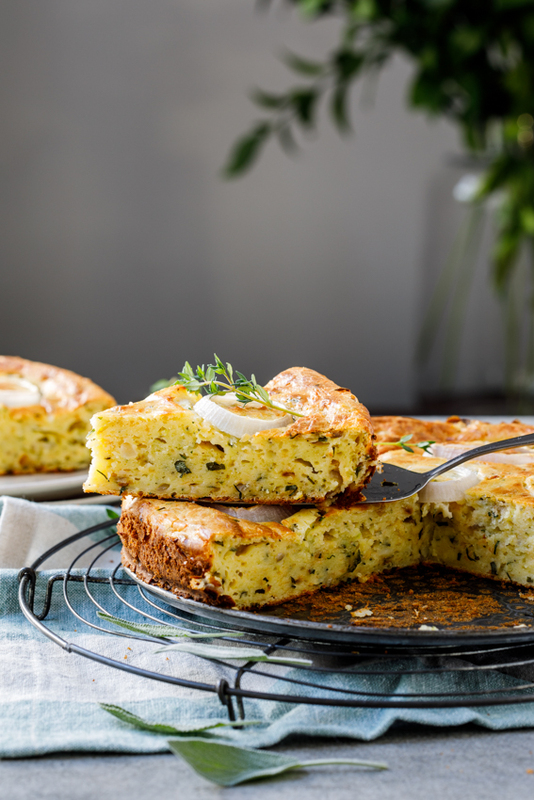 This savoury cake recipe is pretty much the love child of a quiche and a savoury muffin (and if you love the flavour of cheese souffle, you’ll LOVE this recipe). 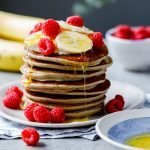 It is rich yet light and very easy to eat. With a base of creamed cottage cheese, eggs and cheddar cheese, how could it not be? I added lots of fresh herbs (sage, parsley, chives and thyme) and sautéed red onion for added interest and as I so loved the look of Ottolenghi’s savoury cake topped with onion rings, borrowed the idea. I love how the onions char a little around the edges and add their sweetness to the cake. 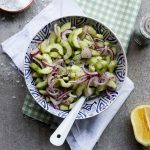 I served the savoury cake with a green salad for lunch but it would be equally fantastic as a vegetarian main or as part of a brunch spread. Or sneakily eaten at your kitchen counter because it is just so good. No judgement. I used Lancewood’s Creamed smooth cottage cheese for the cake and it added such smooth richness. 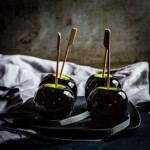 I wanted to demonstrate using their products in a savoury recipe as they are so versatile. Lancewood has launched the LANCEWOOD Cake-Off® competition for home bakers. 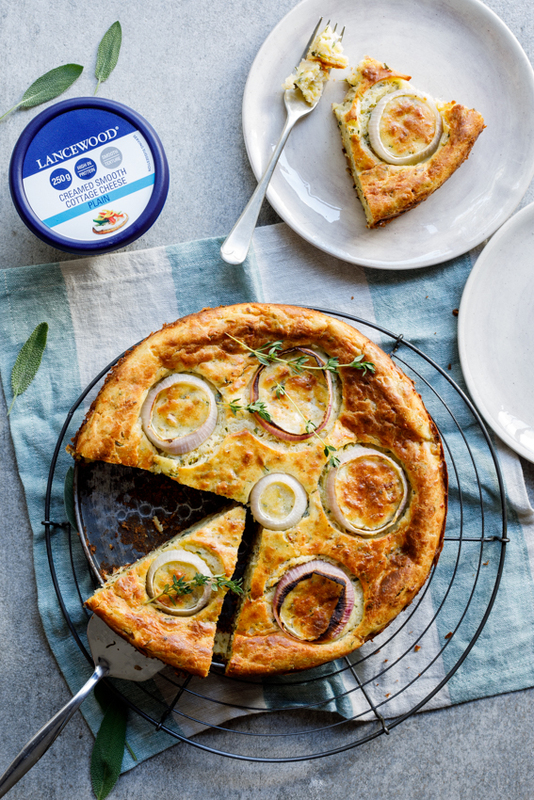 Bake a creative cake with Lancewood Cheese and you could win a trip to New York! To enter, upload a picture of your cake, your Lancewood Cheese next to it, and your recipe to lancewoodcakeoff.co.za. Finalists will get to Cake-Off LIVE on the Expresso Show. Recipe submissions will run until Sunday, 20 May 2018. Be sure to enter your most beautiful image of your cake (and include the Lancewood packaging in your shot) and get baking! This is one competition you DON’T want to miss out on. Follow Lancewood on Facebook and Instagram for more info. 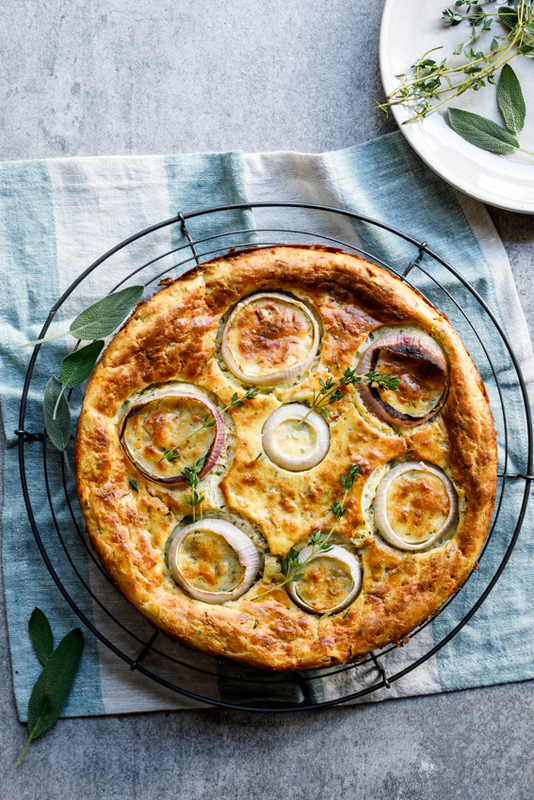 Inspired by Ottolenghi's cauliflower cake, this cheese and onion savoury cake is filled with cheese, herbs and red onion. 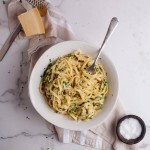 It is the perfect elegant yet easy lunch recipe and will make an excellent vegetarian main. Pre-heat the oven to 180ºC and grease a 20cm springform pan. Cream together the butter and cottage cheese until smooth and pale. Add the eggs, one a time, scraping down the bowl after each addition and mixing well. Add the sauteed onions, cheddar cheese and herbs and mix well. Scrape bowl again. Add the flour, baking powder, salt and pepper and mix until just combined. Transfer batter to prepared cake pan and top with onion rings. Place in the oven and allow to bake for 45 minutes - 1 hour until the top is golden brown and a skewer inserted comes out clean. Remove from the oven and allow to cool for 20-30 minutes until warm, but not hot. This post was sponsored by Lancewood cheese. All opinions, words and images are my own. Hi! I am in the US and I don’t think we do Creamed Smooth Cottage Cheese here (or at least not where I live), I think I may have to make a substitute…is it a small curd cottage cheese with cream added or is it smooth as in blended? It’s a smooth cottage cheese which is pretty much the same texture as cream cheese. You could totally just sub in cream cheese if you can’t find creamed cottage cheese. What an interesting recipe Alida! I love the idea of a savory cake! On my baking list! So simple and so inviting ! I really enjoy your creations ! I’ve never worked with quark so can’t be sure. 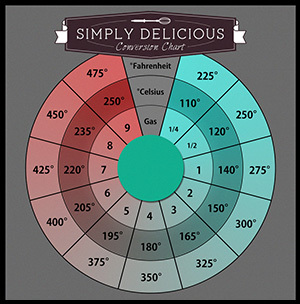 If you can’t find creamed cottage cheese, you can just sub it for cream cheese. Ottolenghi’s cauliflower cake is on regular rotation in my house so I am very excited to try your recipe. Love all the cheese and herbs! I can’t wait to hear what you think of my recipe Cam! I am so intrigued by this recipe. I just love quiche so I can only imagine I’d love this too. Can’t wait to try it. You will LOVE it Joanne!